Searching for home furnishings is a challenge. Because furniture buyers must consider money, style, shipping and custom options. But searching for contemporary bedroom furniture compounds the difficulty. Comfort and durability become key factors in shaping the decision to buy furniture. So Something to Sleep On: Contemporary Bedroom Furniture should help make the search easier. 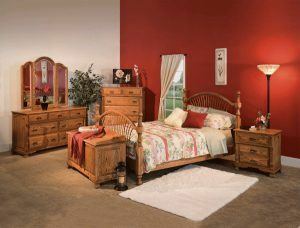 The Large Classic Heritage Bedroom Set features a timeless style. While there are countless retailers to consider, consider solid wood furniture retailers for durability and custom options. And among solid wood furniture retailers, the Amish are the best in the game. The Large Classic Heritage Bedroom Set, pictured here, features the timeless “heritage” style, cathedral raised panels, solid oak construction, a beautifully-carved base and a huge variety of custom options.